Starbucks announced Thursday it will offer an in-store digital network that will try to make customers’ coffee house experience at little more social. Want a little community with that coffee? Starbucks is launching a new in-store digital network in an effort to make customers’ coffee house experience a little more social. It’s the coffee giant’s latest shot in its battle against independent coffee houses. With over 16,000 stores in more than 50 countries, Starbucks often is mocked for the ubiquity of its outlets and a cookie-cutter feel of its corporate-owned outlets. Starbucks' latest weapon in the fight against that image is to deploy free Wi-Fi and an in-store digital network that will offer news and entertainment as well as localized content to encourage neighborhood involvement. Customers will be able to access the digital network later this fall. Whether this digital network actually draws people out or simply buries them more deeply behind their digital devices remains to be seen. 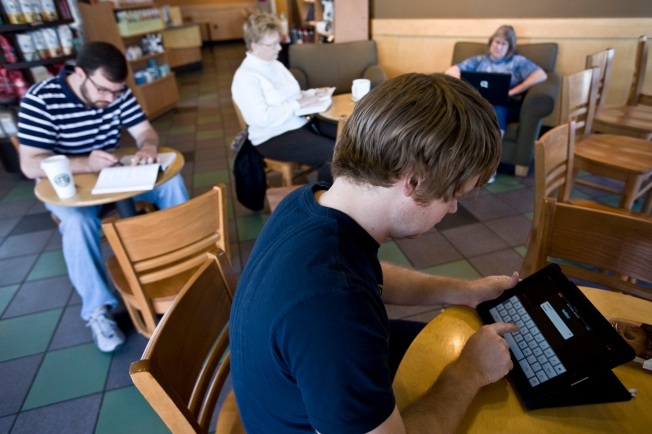 As Starbucks removes the fees from its Wi-Fi network — a move announced in June — some independent coffee shops have started ditching the digital connection. Many say it creates an isolating environment or encourages squatters who consume more bandwidth than coffee. But Starbucks is sticking with its digital vision as part of a turnaround effort that seems to be working. The coffee chain was among the first to feel the pain of the recession, but Starbucks CEO and founder Howard Schultz has taken back the reins, and the results have been impressive, with profits up 37 percent in its latest quarter. After researching what people are doing before and after they enter its stores, Starbucks teamed with content partners to offer customers digital one-stop shopping for their activities. When customers log into Starbucks' Wi-Fi network, they will come to a splash page for the Starbucks Digital Network that they can either explore or navigate away from. Review site Zagat will let users look up local restaurants for dinner after caffeinated drinks. Runners, bikers and walkers will be able to plan their routes through Rodale on geo-targeted maps highlighting Starbucks outlets. Patch, a community news site, will provide Starbucks patrons a chance to learn about events in their neighborhoods. Nonprofit DonorsChoose.org will suggest local educational projects they need funds. “In some ways one of the most interesting and important aspects of the Starbucks Digital Network is that it actually can be a hyper-local, community-oriented offering,” said Adam Brotman, vice president of digital ventures for Starbucks. While the network will serve as marketing, it will also produce revenue for Starbucks through revenue sharing with some of its partners when Starbucks customers buy downloads or subscribe to partners' services. Future possibilities include collaboration with more nonprofits and volunteer groups and local news from outlets such as the Wall Street Journal, USA Today and New York Times. Music from local bands could be featured through iTunes. Customers connect in a variety of ways and the digital network is Starbuck’s way of recognizing that, according to Brotman. “That Starbucks experience, part of it sometimes is connecting with somebody physically who’s across the table from you, or connecting with our baristas, sometimes it’s connecting with somebody over the Internet,” he said. Brotman said Starbucks will watch for possible laptop gridlock in its stores. “We’ll keep an eye on it and if it becomes a problem, like we always have, we’ll address it with our customers and through maybe ideas like different store design or different layouts. But right now we’re feeling like this is something our customers want and we’re feeling good about it,” Brotman said.